Can OCTA Improve the Care of Patients with AMD? Optical coherence tomography angiography (OCTA) is a new imaging technology with the potential to advance our current knowledge of choroidal and retinal disorders. OCTA is non-invasive and non-dye-based, and provides high-resolution, depth-resolved images of vascular flow in the retina and choriocapillaris in a matter of seconds.1 OCTA is particularly useful for evaluating patients with age-related macular degeneration (AMD) because the three-dimensional image sets can be segmented into en-face OCT angiograms of layers such as the choroid and outer retina where choroidal neovascularization (CNV) may be detected.2,3 Currently available commercial OCTA devices allow for manual adjustment of the automated segmentation lines for precise examination of the superficial and deep retinal vascular plexuses, outer retina, and choriocapillaris. Furthermore, the OCT angiograms are co-registered with OCT B-scans and en-face images to provide structural and blood flow information in tandem. So how do these features help to evaluate and treat patients with AMD? Many CNV lesions can be detected with high sensitivity and specificity using outer retina OCT angiogram segmentation (Figure 1).2,4 The outer retina OCT angiogram segments between the outer plexiform layer and Bruch’s membrane; this region is avascular in normal eyes so the OCTA scan should be devoid of flow signal. Thus, vessels imaged on OCTA in the outer retina scan generally represent CNV. The morphology of CNV has been classified by appearance on OCTA as either a well-circumscribed seafan network or a poorly-circumscribed filamentous vascular tree within and/or above a retinal pigment epithelial detachment (PED) or even a retinal scar.2,5 In subtle cases of CNV with very thin lacy vessels on OCTA, the user can adjust the automated segmentation lines manually in order to thin the area of focus and then scan through the PED more closely using the co-registered OCT B-scans as a reference point. Another method of CNV detection is via evaluation of the OCT angiogram segmentation of the choriocapillaris. Sometimes a choroidal feeder vessel or net of vessels to the CNV can be detected and/or a projection artifact of an overlying CNV may be observed. Figure 1. OCTA demonstrates CNV in a patient with AMD. (a) Color photo shows abnormal foveal pigmentation and AMD that appears to be dry. There is no apparent hemorrhage, exudate or fluid. The patient was status post anti-VEGF injection six months prior to imaging. (b) Thinning is noted on OCT thickness map. (c) Avanti OCTA overview shows CNV in the outer retina and choriocapillaris OCT angiogram segmentations (arrows) and subtle subretinal fluid on the corresponding OCT B-scans. OCTA also has utility in evaluating the dry or non-neovascular form of AMD. The density of the choriocapillaris below drusen has been shown to be decreased both focally and generally in eyes with dry AMD, especially with increased drusen burden.9 Similarly, choroidal thickness is decreased in eyes with dry AMD.10 In eyes with advanced atrophic AMD, choriocapillaris blood flow impairment (seen as decreased or absent flow) has been shown to occur below the absent retinal pigment epithelium (RPE) and can even be seen to extend beyond the margin of geographic atrophy, suggesting that choriocapillaris blood flow alterations occur before the RPE loss (Figure 2).10,11 Historically, the choroid has been difficult to image. However, with the development of OCTA, our understanding of the pathology underlying diseases such as AMD may improve. Figure 2. Geographic atrophy associated with AMD. (a) Red-free imaging shows increased visualization of the choriocapillaris due to RPE loss. (b) OCT B-scans show increased signal intensity below the regions of RPE and photoreceptor loss (reverse shadowing), characteristic of geographic atrophy (between arrowheads). (c) Zeiss OCTA overview demonstrates increased signal intensity and decreased choriocapillaris density (arrow) below the area of geographic atrophy. In summary, OCTA is a new and exciting non-invasive technology that offers rapid, high-quality images of the retinal and choroidal vasculature. 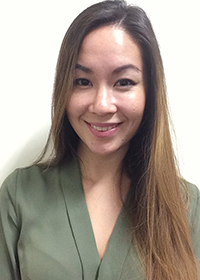 Multiple recent research studies have revolved around the utility of OCTA in evaluating eyes with AMD and/or CNV. The unique abilities of OCTA to segment different vascular plexuses and provide both structural and flow information in tandem enable OCTA to play an important role in detecting and monitoring CNV in eyes with AMD, and may improve our understanding of choroidal and retinal disease processes. Dr. Baumal has no relevant disclosures to this manuscript. 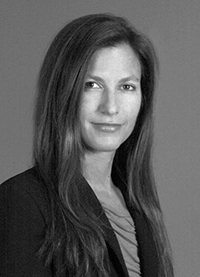 She was on an advisory board and a speaker for Allergan in 2016. Dr. de Carlo has no disclosures. This work was supported in part by an unrestricted grant from the Massachusetts Lions Club. Reference(s): 1. de Carlo TE, Romano A, Waheed NK, Duker JS. A review of optical coherence tomography angiography (OCTA). Int J Ret Vitr. 2015 Apr 15;1:5. 2. de Carlo TE, Bonini Filho MA, Chin AT, et al. 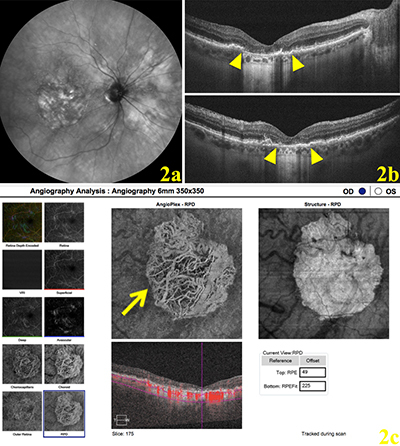 Spectral-domain optical coherence tomography angiography (OCTA) of choroidal neovascularization. Ophthalmology. 2015;122(6):1228-1238. 3. Roisman L, Zhang Q, Wang RK, et al. Optical Coherence Tomography Angiography of Asymptomatic Neovascularization in Intermediate Age-Related Macular Degeneration. Ophthalmology. 2016;123(6):1309-1319. 4. Bonini Filho MA, de Carlo TE, Ferrara D, et al. Association of Choroidal Neovascularization and Chronic Central Serous Chorioretinopathy with Optical Coherence Tomography Angiography. JAMA Ophthalmol. 2015;133(8):899-906. 5. Miere A, Semoun O, Cohen SY, et al. Optical Coherence Tomography Angiography Features of Subretinal Fibrosis in Age-Related Macular Degeneration. Retina. 2015;35(11):2275-2284. 6. Muakkassa NM, Chin AT, de Carlo T, et al. Characterizing the Effect of Anti-Vascular Endothelial Growth Factor Therapy on Treatment-Naïve Choroidal Neovascularization Using Optical Coherence Tomography Angiography. Retina. 2015;35(11):2252-2259. 7. Marques JP, Cost JF, Marques M, Cachulo ML, Figueira J, Silva R. Sequential Morphological Changes in CNV Net After Intravitreal Anti-VEGF Evaluated with OCT Angiography. Ophthalmic Res. 2016;55(3):145-151. 8. Lumbroso B, Rispoli M, Savastano MC. Longitudinal Optical Coherence Tomography Angiography Study of Type 2 Naïve Choroidal Neovascularization Early Response After Treatment. Retina. 2015;35(11):2242-2251. 9. de Carlo TE, Moult E, Choi W, Waheed NK, Duker JS, Fujimoto JG. Non-Neovascular Age-Related Macular Degeneration. In Clinical OCT Angiography Atlas, 1st ed. Lumbroso B, Huang D, Chen CJ, et al, eds. New Delhi, India: Jaypee Brothers Medical Publishers. 2015:75-88. 10. 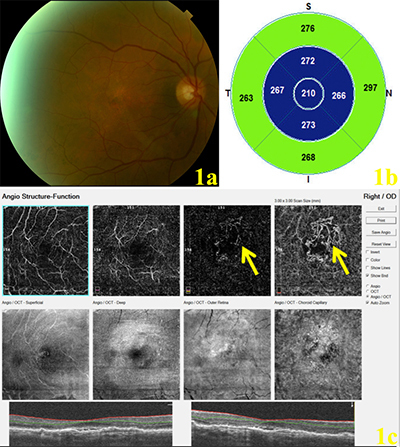 Toto L, Borrelli E, Di Antonio L, Carpineto P, Mastropasqua R. Retinal Vascular Plexuses’ Changes in Dry Age-Related Macular Degeneration, Evaluated by Means of Optical Coherence Tomography Angiography. Retina. 2016;36(8):1566-1572. 11. Choi W, Moult E, Waheed NK, et al. Ultrahigh-Speed, Swept-Source Optical Coherence Tomography Angiography in Non-Exudative Age-Related Macular Degeneration with Geographic Atrophy. Ophthalmology. 2015;122(12):2532-2544.